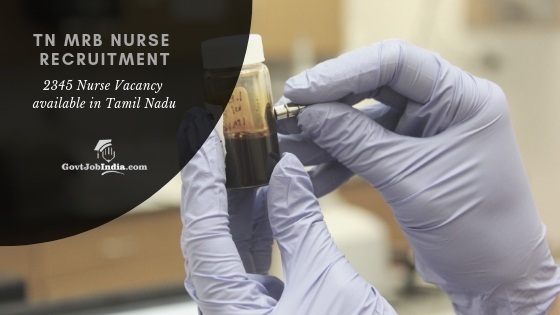 TN MRB Nurse Recruitment 2019: All aspiring job seekers in the state of Tamil Nadu are invited by the Tamil Nadu Medical Recruitment Board to Apply online for the TN MRB Nurse Recruitment 2019. There are presently 2345 Nurse vacancies available in Tamil Nadu. Interested candidates are requested to apply online for these posts before the last date on 27th February 2019. This is an amazing opportunity for all the candidates in Tamil Nadu who are seeking a Govt Nursing Job. So we recommend that you prepare well for the TN MRB Nurse Recruitment process and not let this opportunity pass you by. The TN MRB offers you a high paying, secure job from where you can build the foundations of a long and fruitful Govt career in the Tamil Nadu. All the details you need regarding the TN MRB Nurse recruitment has been provided here on this page. We have taken great care in ensuring that all the latest details regarding the TNMRB Nurse salary, eligibility criteria, online application form and fee structure for the exam are all available right here in this page. So make sure to go through this page carefully and ensure that you are eligible for the TNMRB Nurse recruitment 2019. Required Educational Qualification Three years in General Nursing with at least six months in midwifery Training or degree in nursing from a recognized University of the Indian Nursing Council. Along with the Educational Qualification, there are also a number of experience related qualifications that the candidates must possess if they want to be eligible for selection. We request that you check out the details provided in the official TN MRB Nurse Recruitment notification PDF for more details. Visit MRB Website which is www.mrb.tn.gov.in. Click New registration to open up the online application form. Fill all details with accurate details without making any errors. Mobile number and email id are mandatory for TN MRB Nurse Online Application. All communication from TN MRB will be made through the mobile number and email ID you supply during registration. You can now proceed to pay the TN MRB Nurse application fees via net banking, debit card or credit card. This completes the application procedure. We hope you are satisfied with all the information that we have provided here regarding the TN MRB Nurse Recruitment 2019. Every year there are lakhs of Nursing aspirants who pass out of colleges in India, all of whom are on the lookout for opportunities such as the one provided here by the TN MRB Nurse recruitment. So make sure that you prepare well for your TN MRB Nurse exam and yourself one of the elite nursing candidates who is set to be recruited by the TN MRB. In case you have any doubts regarding the TN MRB nurse recruitment then you can address them in the comment section below. All the best!